The 2018 English national cross-country championships returned to Parliament Hill Fields for the first time in three years and witnessed record fields, with nearly 6,500 runners completing the various courses. That was 1,000-plus more than the previous record – showing that cross-country is currently booming at club and county levels. A squad of 35 of Chichester’s best runners headed to the iconic setting and against the best runners in the country there were fine individual performances, notably 21st place from Will Broom in the under-17 men’s race and a club-record 33rd place by Beth Garland in the senior women’s race. As for Chichester’s teams, highlight of the day was a stunning 12th place from the under-17 men while the senior men were pleased to finish 81st, just inside the top half of 182 teams, and 65th in the nine-to-score category. The highest finishing places in the under-13 races came from Eva and Isobel Buckler, who crossed the line 58th and 87th out of nearly 500 runners. The twins were two of just eight Chichester Runners who made the top 100 in any race. Next home in the under-13 girls’ race was Cerys Dickinson, 257th but barely a minute outside the top 100. The under-13 boys fielded a full team and a reserve. Fast-improving Fionn O’Murchu was first home in 118th place followed 12 seconds later by Joe McLarnon in 156th, with Harvey McGuiness in 223th and Ollie Fuller in 456th. Reserve Barney McLarnon was 467th. They had a team position of 37th out of 56. Another top-100 placing was from Liam Dunne in the under-15 boys’ race although he was disappointed not to reproduce the form which saw him finish fifth in the south of England championships. Having one slightly-below-par race cannot take away from the fantastic season Dunne has had, becoming county champion. In the under-15 girls’ race, Chichester two representatives acquitted themselves with credit with Nina Moranne finishing 339th followed two seconds later by clubmate Nicole Boltwood. Chichester’s under-17 men had already achieved a club record fifth place in the South of England championships but were without fourth scorer Ben Collins in London. But three fine runs from the club’s top runners, with the reserves stepping up to the plate, gave the club a finishing place of 12th, just behind the strongly-fancied Portsmouth in tenth. Will Broom had one of the runs of the day for Chichester by improving his 29th place at the South of England event to a fine 21st in the nationals, barely a minute behind Portsmouth’s runner-up Lachlan Wellington. Next home for Chichester were Leo Stallard and Ned Potter in 74th and 75th with a single second separating them. All eyes were on JJ Staples and Harry Sage to see who would be the crucial fourth scorer for the team and Staples came home in 246th, just ahead of Sage in 275th, giving Chichester their highest team placing of the day. In the under-17 women’s race, injury robbed Chichester a chance of a good team placing but Alice Cox-Rusbridge continued her fine season with 98th place, with team-mate Beth Brown battling hard to finish 256th. There was just one Chichester athlete in the under-20s with Ben Morton another athlete to maintain his high standard this season, finishing 112th. A traffic hold-up prevented most of Chichester’s women’s team from having time to collect their chip-timing straps before the start and although they were able to run in the race, no official positions could be given. One runner who arrived from the opposite end of the country did score, however, and produced the best senior women’s national performance in the club’s history. Medical student Beth Garland travelled down from Leeds where she is based and ran the race of her life to finish 33rd out of 1,100 of the best women cross-country runners in England. Garland had already made a breakthrough by winning bronze at the Sussex championships at Bexhill and had followed this with a good showing for her university in the British Colleges Championships. But the run at Parliament Hill eclipsed what she had done before as she left many illustrious names of English middle-distance running in her wake. Chichester’s senior men fielded a full team of a dozen runners. Leading Chichester home once again was James Baker who, despite being in the middle of marathon training, finished a creditable 188th out of the record field of more than 2,300 runners. Runner-up was Andy Maud of Highgate Harriers, who recently finished second in the Chichester Priory 10k. Another Chichester athlete who has been improving quickly this winter is Mike Houston, who was 358th, followed by Tom Pritchard in 695th. Making it a family double was Jim Garland, now in the over-50 ranks but finishing as fourth scorer in 1,036th. Close packing from John Bullard in 1,538th and Jason Boswell in 1,576th helped give the club a creditable placing of 81st, just inside the top half of the 162 clubs to complete a team finish. 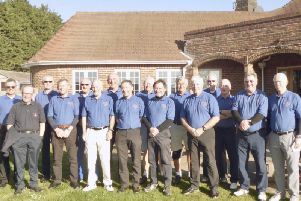 In the nine-to-score rankings in the national for the senior men,the club finished 65th thanks to Gary Williams in 1,719th, Richard Miles 1,875th and Mike Moorcroft 2,051st. To complete Chichester’s scoring after five hours of competitive running, the final three men all completed the tough hilly London course to bring the full 12 home, with Tom Blaylock 2,139th, Kevin Batt 2,235th and Peter Anderson 2,287th.